A panel of speakers discussed the political significance of Afghanistan’s archaeological heritage at an event entitled “Culture, Conservation and Meaning: The Politics of Heritage in Afghanistan” on March 5. The event, hosted by the Council of Middle East Studies at the MacMillan Center, explored the relationship between cultural heritage and power in Afghanistan, looking at both historic as well as post-Taliban heritage conservation projects. The panelists were Warwick Ball, the Editor-in-Chief of the scholarly journal Afghanistan, J. Eva Meharry, a PhD Candidate at the University of Cambridge, and Jolyon Leslie from the Afghan Cultural Heritage Consulting Organization. The panel was moderated by Yale postdoctoral fellow Naysan Adlparvar, and Nahid Siamdoust, Yale Ehsan Yarshater Fellow, participated as a discussant. Each of the speakers addressed the topic at hand through a different temporal lens, resulting in a wide-ranging conversation. Introducing the topic, Adlparvar drew the audience’s attention to an image of a plaque outside the National Museum of Afghanistan which states “A Nation Stays Alive, When Its Culture Stays Alive.” Unpacking a perhaps hidden complexity that the quote does not capture, Adlparvar explained that Afghanistan, even in just the past century has passed through many different visions of what a nation is. After Adlparvar’s introduction, the first speaker, Ball, took the floor. He spoke about the early 20th century emergence of Afghan Archaeology and the initial emphasis placed on pre-Islamic history. He focused in particular on the great Buddhas of Bamiyan — two 7th-century monumental statues carved into the side of a cliff in Afghanistan’s Bamiyan valley — which represent one of the best known and widely-disputed heritage sites in Afghanistan. At the thrust of Ball’s presentation was the notion that Bamiyan has become an “icon for all” — an image for many different peoples for many different reasons. 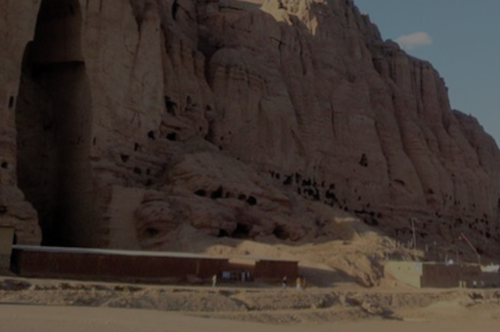 For the Taliban, Ball said, Bamiyan represented everything that they disliked under their own brand of Islam, but more importantly it represented their complete disregard of the world at large. He added that after the destruction of the statues in 2001, Bamiyan became a symbol for the United States of their War on Terror. According to Ball, Bamiyan even had a rather odd symbolism for the Soviets, who depicted the great Buddha of Bamiyan on one of their medals. In her presentation, entitled “Politics of the Past: Archaeology, Nationalism, and Diplomacy in Afghanistan (1919-2001),” Meharry used the iconic case of Bamiyan to explore how key actors, including foreign archaeologists; conservative religious groups; and Afghan political administrations shaped the politicization of archaeology in the modern Afghan nation-state. Over the course of the modern history of Afghanistan, Meharry said, archaeology became a political tool for both conservative and progressive ideologies. Pre-Islamic archaeological sites and museum displays were symbolic of the progressive political agenda, and one form of the protest by dissenters was to attack these sites. Meharry outlined a number of instances of revolt against the pre-Islamic past, including a 1924 attack at the archeological site of Hadda, a Greco-Buddhist site near the south-eastern border shared with then-British India. Leslie concluded the panel with a presentation on current efforts to preserve Afghan heritage in the insecure and deeply politicized post-Taliban era. Before delving into a discussion of two specific conservation projects, Leslie emphasized that an understanding of history is essential for cultural projects to stand any chance of being effective. The two conservation initiatives Leslie spoke about — the conservation of a brick mausoleum not far from the provincial capital of Helmand province Lashkargah and the ongoing conservation of a Buddhist site, at Top Dara, some 40 kilometers north of Kabul — offered a glimpse into how the instrumentalization of cultural heritage can impact work on the ground. According to Leslie, both sites are located in rural areas that, to different degrees, are contested between the government and opposition groups and therefore require a ‘light touch’ at all stages of implementation. Concluding his presentation, Leslie stressed the importance of implementing cultural initiatives on the terms of ordinary Afghans who, despite limited opportunities for education, have a feel for where, and when, their society has its roots. In response, Ball stressed the importance of emphasizing that the identity of historical monuments is not religious but said that as far as he knows that is not being done within Afghanistan. The event concluded with a Q&A session with audience members. Written by Zainab Hamid, Yale College Class of 2019.